It’s hard finding something in common with the Prince of Lies, but in The Current Number of the Beast that’s exactly what you have to do. Just be glad the only thing you have to match is his number and not his disposition. 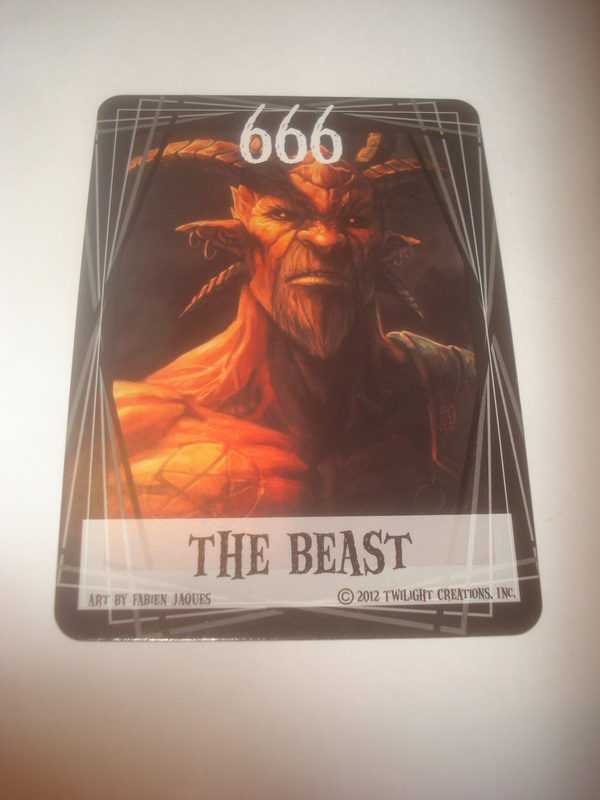 The object of the game is to be the first person to make his dice conform to the current number of the Beast. Two to six players get a hand of three cards and a set of three dice. Each set is rolled randomly to give the owner his starting number. The Beast, a black-bordered card, sits ominously in the middle of the table beside another set of three randomly rolled dice. On his turn a player plays cards hoping to either change his dice to match the Beast’s number (666, naturally) or delay others from doing the same. Cards may permit you to reroll one of your dice (like Desperate Times), change it to the next-highest number (Flight of the Icarus), or mess with someone else’s progress (Angel of Death – see a pattern emerging?). 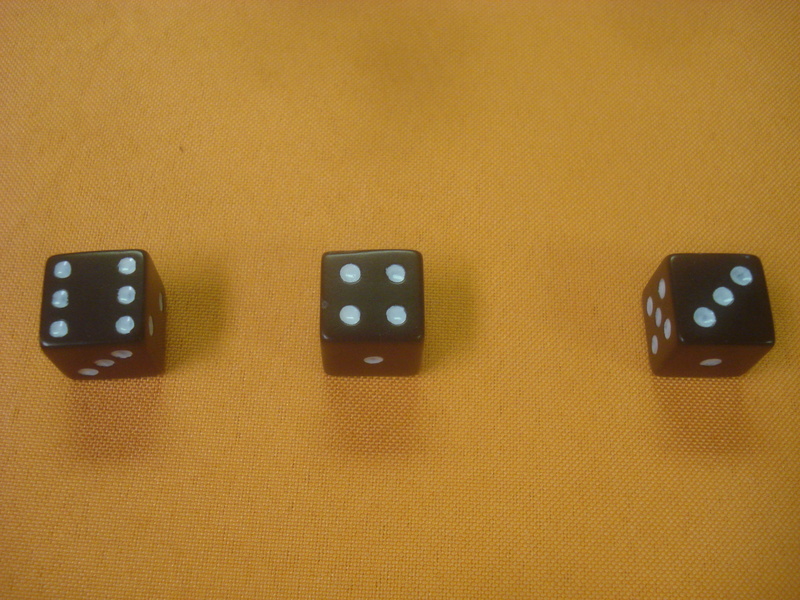 The dice in the center of the table are a sort of common pool; players with the right card may switch one of those dice with one of theirs to get closer to the goal. It’s not as easy as it sounds since one’s dice must remain in the same order. You can’t simply change one die’s facing or switch it with the central pool and then rearrange their order to suit. Manipulate your middle die or trade it out with something from the center of the table and it remains your middle die. If you do get a die result you want, chances are an opponent will alter it – time to play a Freeze card to lock it in place. So why does all this make any difference if you’re going for all 6s anyway? Because no matter your precautions, some spoilsport is also going to change The Beast – after all, he may be the devious Lord of the Pit but he’s the devious Lord of the Pit with friends and family. There’s Friend of the Beast, his cousin, his neighbor . . . and all these folks have a different number. Whether a little off (665) or a lot (333), suddenly the winning conditions have taken a wicked curve and one may need to begin anew. Time to start removing those Freezes. 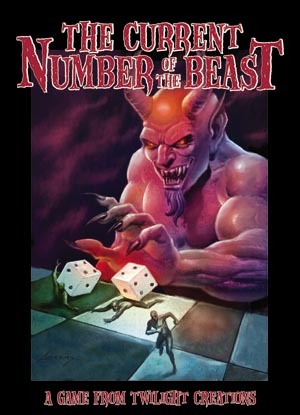 Eventually some lucky devil gets the right combination, matching his dice to the current Beast’s number, at which point he’s declared the winner and given the key to the underworld. 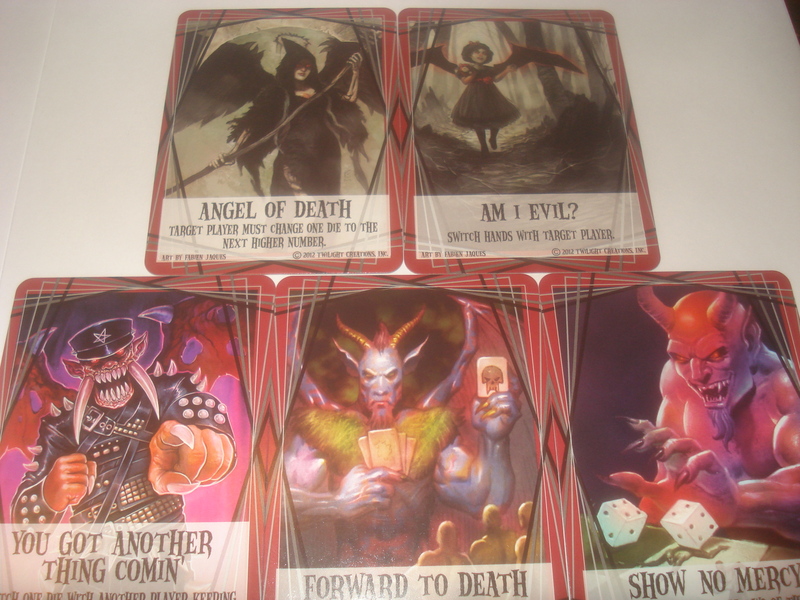 The artwork pulls some hairpin turns, from cartoonish to seemingly unfinished to downright polished, but it’s a pretty good gallery for a card game showing the art of the damned. If you’ve bought a Twilight Creations game before, you know to expect a simple and unassuming set of rules in black and white no longer than four pages, but that covers the subject. The dice are black (natch) and tough-looking, and the box, one of those tiered deals where the top is shallower than the bottom and so doesn’t close over it all the way, is almost impossible to open save for the precious fingerhold provided by the staggered box levels. The Current Number of the Beast isn’t a complex exercise, and its straightforward play takes some of the “cunning and skill” the box boasts out of the equation. The luck of the draw and the roll of a die play big parts so taking charge of your strategy may rely as much on bedeviling opponents as captaining your own destiny. Which is not to say it isn’t entertaining: Any friendly competition that pits players so directly against each other is going to generate laughs or resentment (or perhaps both – better the devil you know than the devil you don’t), and might command a second go-round so someone can exact revenge. It’s billed as taking 30 minutes to an hour, and that seems about right (it comes in on the low end unless participants have a run of stick-it-to-the-leader plays). It doesn’t flow with quite the fast pace the box claims, but it’s not long and can be played several times a night while waiting for late gamers; used as light or introductory fluff; or employed as a breather between larger games. The Current Number of the Beast is too short not to be fun and too infuriating to be ignored. It lacks the heft serious gamers want to grab hold of, but anyone who isn’t taken with the title, drawn in by the dark subject matter, and amused for at least a little while by the simple mechanics probably doesn’t know how good it is to be bad.